Gift baskets are fun to put together and also fun to receive. Whether you are the giver or the recipient, read on to learn about some affordable and fun baskets you can put together and give as a wedding gift. Who doesn’t love pasta? Put together an Italian themed basket. Include specialty noodles (which you can find in the pasta aisle of your local grocery store for a dollar or two extra than traditional ones), jar your own tomato sauce, toss in a few pertinent dried herb bottles (like basil, oregano, and garlic powder-many stores offer them at 3 for a dollar), add some olive oil, and even pick up some cooking tools like a slotted spoon, and mini strainer, and a cheese grater. You can also find some barely used cookbooks that are in excellent shape for a very low price on some online market places that you can place in it as well! Mangiare! Pick up several bottles of wine that are on sale at your local liquor store. Print out several labels on your computer that highlight the couple’s potential firsts-First House, First Baby, First Anniversary, First Fight, etc. Type up an explanation of the basket and place it in a dollar store frame. Explain to the couple that they are only to open each bottle of wine when a first moment has occurred! If you have some extra dollars to burn, place cork stoppers, a wine aerator, and even personalized wine glasses inside as well! Write a little note that describes the intent of the basket-for cozy nights in on the couch. Add a blanket; some Oscar nominated flicks, bags of microwave popcorn, flavored popcorn mixes, milk duds, licorice, (or whatever candy is on sale at the store). It’s a sweet and thoughtful gesture, which is light on your budget and which the couple is sure to appreciate. Picnic baskets can be very expensive. You can absolutely make your own, based on your budget. Pick up a basket that closely resembles one of these romantic, recreational baskets at your local dollar store or flea market. Add in some basic white plates, silverware, a thermos, a checkered cloth to sit on, and some wine glasses. All items can be purchased two for a dollar at most bargain stores, and you can even scan flea markets for cheap but beautiful lace napkins, placemats, etc. Now that you have your basket all ready, deliver it with a lasting impression that counts. Starting at just $9.95, add a custom printed fun balloon as the center piece. Quality printers like Mimosa Digital can take any photo, from an old print to a digital photo, add words if requested, and print it on 11″ round or heart-shaped balloons. Best of all, you can order yours online. 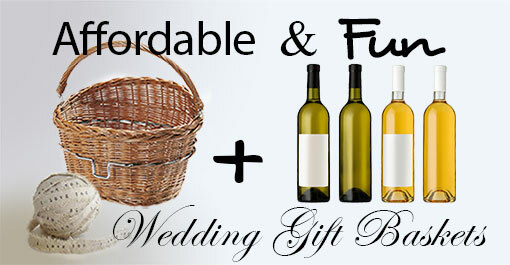 Consider putting together one of these fun and affordable gift baskets for your next upcoming wedding!